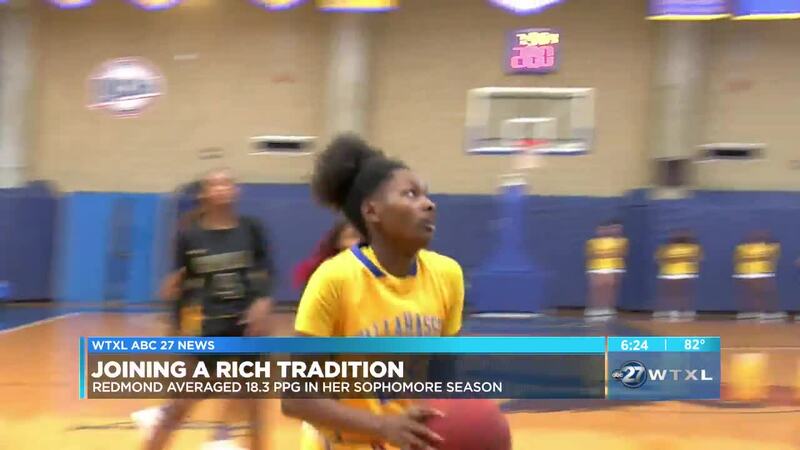 TALLAHASSEE, Fla. — Tallahassee Community College women's basketball standout Juliunn Redmond has picked up a second all-America honor. On Monday, the sophomore guard was named First-team All-America by the National Junior College Athletic Association (NJCAA). Last month, Redmond was named to the Women's Basketball Coaches Association's Two-Year College Coaches' All-America team. Redmond, a native of Chicago, Ill., was previously voted FCSAA State Player of the Year and Panhandle Conference Player of the Year. She joins Lawriell Wilson (2017) as the only players in school history to capture both player of the year awards and earn a pair of first-team all-America honors. As a freshman, Redmond played a key role in Tallahassee's run to the NJCAA Division I Women's Basketball National Championship in 2018. She elevated her game even more as a sophomore, averaging 18.3 points, 5.7 rebounds and 4.8 assists while shooting 48.3 percent from the field and 68.9 percent from the free throw line – all while playing a team-high 30 minutes per game. This marks the third consecutive year (2017- Lawriell Wilson, 2018 – Japonica James) Tallahassee has had a NJCAA first-team all-American.